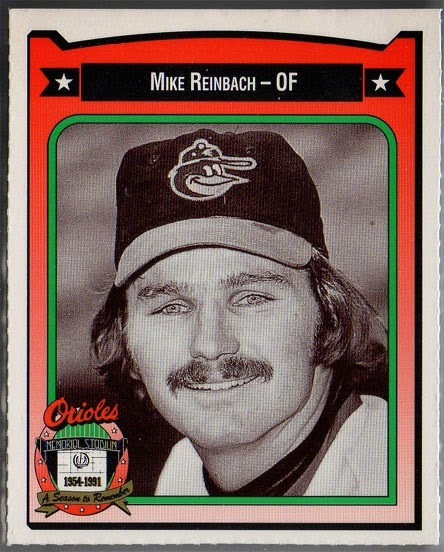 I remember Mike Reinbach, who played in a dozen games for the Orioles in 1974. The game we played in together was an extraordinary one. It was April 27, 1974, the first game of a Sunday afternoon double header at Memorial Stadium. Jim Palmer was pitching against his former teammate, Pat Dobson. The Yankees had come back from a four run deficit to tie the game, 4-4 in the eighth inning. In the top of the twelfth, Jim (who was still in the game) gave up a leadoff Home Run to Craig Nettles. Baltimore tied it up in the bottom of the twelfth when Tommy Davis hit a double, driving in Richie Coggins. Doyle Alexander retired the Yankees 1-2-3 in the top of the thirteenth. In the bottom of the thirteenth, Tom Buskey gave up a leadoff single to Earl Williams and walked Mark Belanger. With runners on first and second and nobody out, Bill Virdon brought me in to pitch. The batter was Mike Reinbach, who singled to center – a walk-off RBI the only time I ever faced him. I’m told he had a tough life after playing a few years in Japan, and for reasons that were never determined, he drove his car off a cliff in 1989, at age 39. Today would have been his 66th birthday.